Welcome to the Sew Some Love linkup! Please link-up any post about a project you're sewing for charity. This week I assembled some donated black and white paper pieced blocks along with black and white scraps to make this top. The blocks, each 8" finished, were originally part of some kind of block swap or bee and each was signed on the back of the paper by the maker. Covered in Love has been so blessed by donations from quilters, I want you all to see what each other have going on! For purposes of the linky, I'm going to define "charity" really generally. If you're sewing a quilt for you co-worker's mom with cancer or your friend's uncle who lost his home, that totally counts! Anything you're sewing out of the goodness of your heart for someone outside you immediate circle of family and friends. If you know of any that need added to the list let me know! Cool modern blocks! They'll make a really nice quilt. When I made a quilt for Covered in Love last year (via H2H) I didn't realize you had a blog of your own. If I can find a way to get your posts via email I'm signing up! 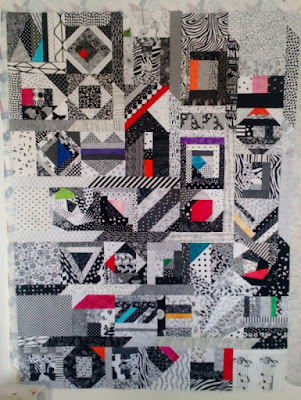 I've been meaning to make another quilt for ETMC, just have to knock out a few other projects first.